Back in 1992 Ducati presented that first, iconic Monster at the Cologne Motor Show. Now, 25 years on, the Monster 821 has received an impressive upgrade. The 821 inherits all the authenticity of that first Monster 900, combining perfect performance with outstanding rider-friendliness. Superb standard equipment, low ownership costs and an extensive accessory range make the Monster 821 the perfect everyday bike, yet give it that unique Ducati sport naked feel that is shared by every Monster. Now, the Monster 821 has been upgraded to include aesthetic and functional features first introduced on the Monster 1200: a more streamlined, agile look with fully redesigned tank and tail, an all-new silencer and a headlight that is both classic and contemporary. Also making its debut on the mid-size Monster is the colour TFT display with selected gear and fuel indicators, while available accessories include the Ducati Quick Shift up/down system. The Euro 4 compliant liquid-cooled Testastretta 11° engine delivers a maximum power of 109 hp (80 kW) at 9250 rpm. Thanks to its 8.8 kgm (86 Nm) of torque at 7750 rpm, the 821 offers exciting performance, easy riding and unmatched fun. 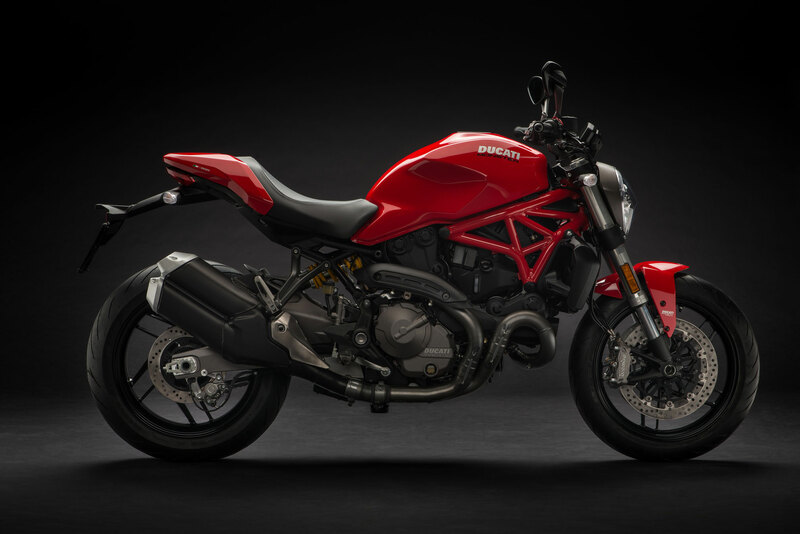 The Monster 821 also features the Ducati Safety Pack, which comprises Bosch ABS and Ducati Traction Control, both of which have adjustable intervention levels. Similarly, maximum power and throttle response can be adjusted via the Power Modes. Riding Modes allow easy adjustment of ABS, DTC and Power Modes, letting riders transform the 821 into three different motorcycles, each with a distinct personality. Completing the impressive equipment array on the Monster 821 are the Brembo brakes, with dual 320 mm discs and M4-32 monobloc radial calipers up front. A refined suspension system includes a 43 mm fork at the front and an adjustable shock absorber at the rear. 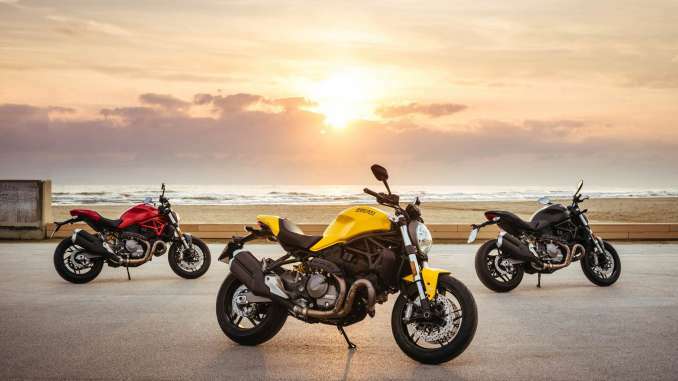 The Monster 821 comes in three different colours: Ducati Red, Black and the classic Ducati Yellow which many a Monster fan has fallen in love with over the years. Essential, sporty, hi-tech but – most importantly – fun. In one word: Monster. With its supremely sporty performance and agility, the new Monster 821 has been designed for maximum riding pleasure. The performance of the 109 HP Testastretta 11° engine is enhanced by the Ducati Safety Pack (ABS and Ducati Traction Control) and the Riding Modes, which guarantee maximum safety always and everywhere. In addition, the Ducati Quick-shift up&down system is available as an accessory. The new TFT colour display provides the rider with all of the necessary information at any time. Over the last 25 years, we’ve never got tired of telling the Monster story. A story made of passion and innovation that has been written together with thousands of people who continue choosing it. The Monster 821 pays homage to the legacy of the Monster 900, which over 25 years ago revolutionised the motorcycle world, embodying the essence of true naked sport. Simple and sporty, agile and powerful, the Monster 821 combines perfect performance and ease of riding. 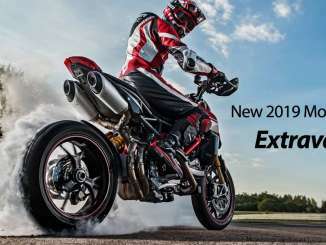 Borgo Panigale, Bologna (Italy), 16 October 2017 – Providing a sneak peek at 2018, Ducati presents the first of 5 new models for the coming season: the Monster 821. The iconic naked motorcycle from Borgo Panigale is presented in a updated version to celebrate the 25th anniversary of the original model – launched at the Cologne Show back in October 1992. The 821 inherits all the character and charm of the first Monster 900, the model that injected new life in the naked racers’ segment – by successfully combining high performance, agility and rider-friendliness. The Monster 821 changes its shape by adopting the design and functional features introduced in the Monster 1200: a sleek, streamlined design with completely redesigned tank and tail end, inspired by the 1992 version. A new racing silencer and headlight – both classic and contemporary, are also part of the new design. For a clear, immediately readable view of all necessary information, on the mid-size Monster a colour TFT display is also making its debut – provided with selected gear and fuel indicators. The Ducati Quick Shift up/down and the Ducati Multimedia Systems are now available as accessories, to further enhance the already excellent riding experience offered by the 821. 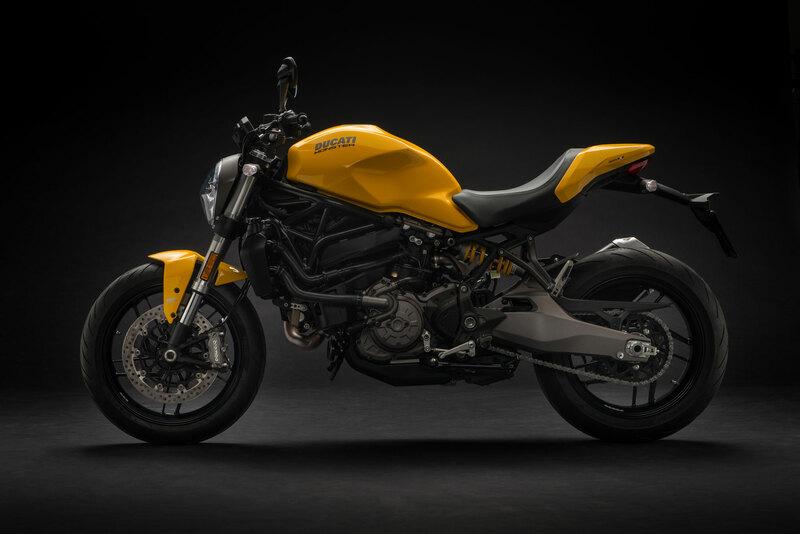 The Monster comes back in the historic Ducati Yellow colour that charmed so many Monster fans in the past. This colour, available for the 821 only, completes the Red and assertive Matte Black colour range. The 109 HP and 9250 rpm of the liquid-cooled twin cylinder Testastretta offer rider-friendly thrills; thanks to its 8.8 kgm (86 Nm) torque at 7750 rpm, the 821 guarantees exciting performance, easy riding and unmatched fun. 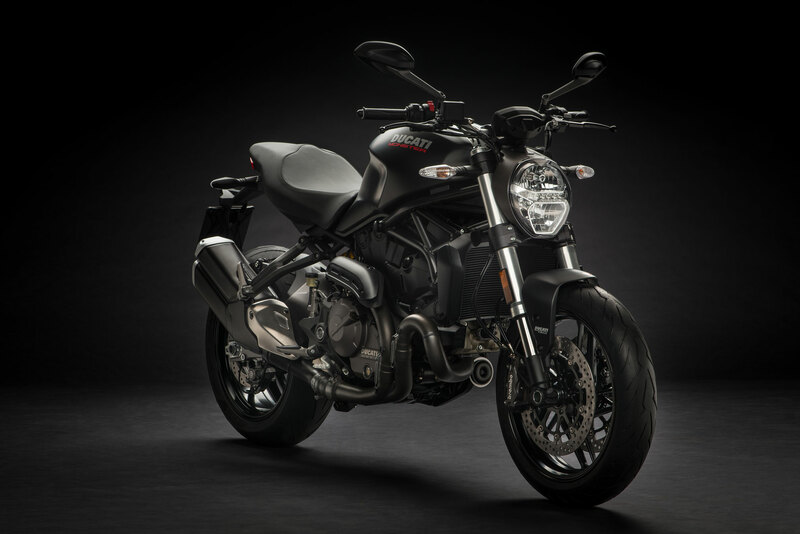 The Monster 821 also features the Ducati Safety Pack, which comprises Bosch ABS and Ducati Traction Control, both of which have adjustable intervention levels. The Riding Modes ensures easy adjustment of ABS, DTC and Power Modes (controlling peak power and type of delivery), allowing the 821 to be transformed into three different motorcycles, each with a distinct personality. Completing the impressive equipment of the Monster 821 are the Brembo brakes, with dual 320 mm discs and M4-32 monobloc radial callipers at the front. The suspension system includes 43 mm forks at the front and an adjustable shock absorber at the rear. The extensive standard equipment, long maintenance intervals, and a rich catalogue of accessories make the 821 the perfect riding partner. The new Monster 821 is just the first of the Ducati 2018 new range. The Ducati World Premiere, to be streamed live on Sunday, 5 November at 9 p.m., will unveil four more new models designed by the Italian manufacturers, which will later be presented to the general public at EICMA – scheduled from 9 to 12 November at the Rho fair. 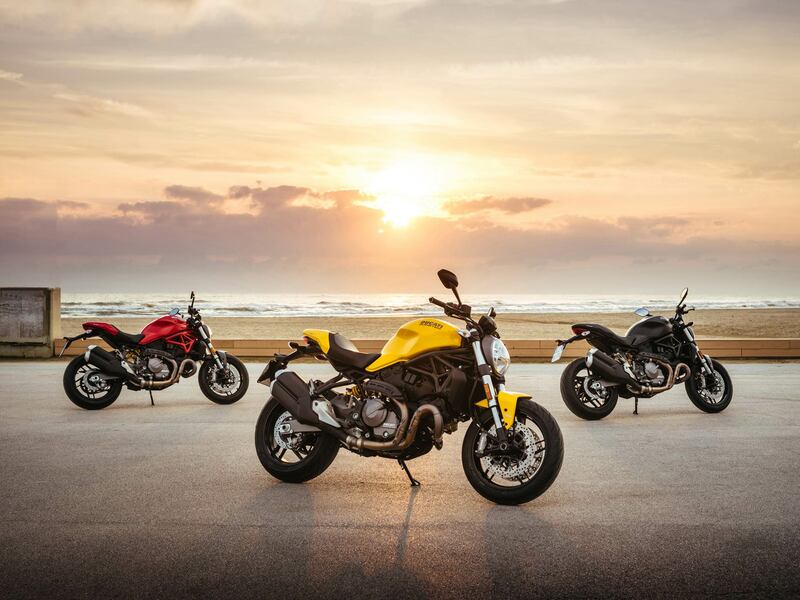 Like the Monster 1200, the 821 has been redesigned to create a sleek, compact bike with true sporting character, to get back to the “sport naked bike” concept but without making drastic changes to the lines of the existing motorcycle. Considerable attention has been given to the tank, now “lighter” and more modern: a fully overhauled design that nevertheless remains faithful to the first ever Monster from the year 1992. To highlight this link with the past even further, the classic anodized aluminium attachment clip is also back. The short, compact, sleek tail, supported by the steel Trellis subframe, lets riders set a seat height of 785 or 810 mm and supports the passenger footpegs, now separated from the rider’s pegs. This configuration gives the Monster 821 a sporting line while improving ergonomics. The new, Euro 4 compliant silencer draws its inspiration from the exhaust on the Monster 1200 R.
Another signature component on the 821 is the round headlight, high-tech yet iconic and, like the tank, identical to the one on the Monster 1200. Twenty-five years on, then, Ducati continues to develop this incredibly successful model. A bike that has, over time, been remoulded and reinvented, become a customisation/personalisation favourite and exerted a huge influence on the entire motorcycle industry for well over two decades. The Monster 821 is powered by the 821 cm³ twin-cylinder Desmodromic Testastretta 11° engine, designed to be a stressed member of the chassis. Euro 4 compliant, it delivers a maximum power of 109 hp (80 kW) at 9250 rpm and a maximum torque of 8.8 kgm (86 Nm) at 7750 rpm. Designed to ensure outstanding pulling power throughout the rev range, this engine is suited to all riders and makes for breathtaking fun. Moreover, lengthy maintenance intervals mean that valve clearance only needs checking every 30,000 km (18,000 miles), making the Monster 821 both reliable and affordable. The 821 cm³ twin-cylinder power unit “breathes” via throttle bodies with Ride-by-Wire control. What’s more, the engine, cooled by a concave radiator mounting two high-efficiency fans, uses the secondary air system to optimise performance by reducing combustion cycle dispersion, but without affecting emissions. The underlying design of the Testastretta 11° engine aims to provide incredibly fluid power that’s easy to handle throughout the rev range. An 11° valve overlap angle ensures outstandingly punchy torque at low-to-mid-range road riding revs. The Monster 821 clutch is of the oil bath anti-patter type with ultra-low effort cable lever control. Spring load is automatically increased by a progressive self-servo system. The outcome is much better fingertip “feel” at the lever, ensuring excellent comfort when frequent gear changes are needed (e.g. in city traffic) and on long rides. When the rear wheel exerts back-torque, the same mechanism reduces pressure on the clutch discs, activating the anti-patter function and so preventing rear end destabilisation during aggressive downshifting. The Monster 821 exhaust ducts, with a cross-section of 50 mm, form part of a 2-1-2 system designed with equal lengths for both cylinders to maximise power and delivery efficiency. This system features a lambda probe for each cylinder so that fuelling control is both autonomous and optimal. Stacked dual silencers feature a catalytic converter to ensure compliance with Euro 4 standards while the electronically controlled adjuster valve optimises exhaust pressure throughout the rev range. On the Monster 821 the engine acts as a load-bearing element, the Trellis frame being attached to the cylinder heads. A racing-derived concept, this was first applied on a factory bike with the Panigale project. This configuration results in a highly compact, light frame, while large cross-section tubing gives the high torsional rigidity that is perfect for bringing out the motorcycle’s dynamic performance. Lastly, the double-sided swingarm on the Monster 821 also ensures a compact 1480 mm wheelbase. The rear seat-carrying subframe – also attached directly to the engine – has been redesigned to provide a compact structure that also supports the new passenger footpeg struts. These pegs are separated from the rider’s to ensure greater freedom of movement in sport-style riding. Both rider and passenger footpeg attachments are made of die-cast aluminium and mount aluminium pegs. To underline the Monster 821’s sport pedigree, the rider’s pegs also feature aluminium heel guards. Up front, the Monster 821 is equipped with a 43 mm fork and, behind, a monoshock with spring pre-load and rebound damping adjustment that makes use of progressive linkage; the shock absorber is attached directly on the vertical cylinder head at one end and on the die-cast aluminium double-sided swingarm at the other. Thanks to firm yet comfortable suspension and an agile chassis geometry, the Monster 821 allows fast changes of direction, putting pure riding pleasure within everyone’s reach. The Monster 821 is equipped with light 10-spoke alloy wheels, 3.5 x 17” up front and 5.5 x 17” at the rear, mounting Pirelli DIABLO ROSSO™ III tyres, 120/70 up front and 180/55 at the rear. The rear bi-compound tyre contains high percentages of silica. Whatever the road conditions, whether dry or wet, grip is excellent, which means outstanding sport-style handling. DIABLO ROSSO™ III tyres offer unmatched performance and long-lasting quality, ensuring constant performance throughout their life cycle. The Monster 821 features top-drawer brakes. Up front it mounts twin Brembo M4-32 4-piston monobloc calipers that grip 320 mm discs and an axial-pump brake lever with incorporated fluid reservoir. At the rear, instead, is a single 245 mm disc gripped by a Brembo caliper; like the front brake, it features enhanced-efficiency sintered brake pads. These components ensure top-notch braking performance, a feature that has always been a Ducati hallmark. The Monster 821 features Ducati Riding Mode technology. This incorporates the 3-level ABS system and 8-level DTC that, together, make up the DSP (Ducati Safety Pack) which optimises vehicle control and enhances ride safety. To ensure ‘monstrous’ yet safe braking power, the Monster 821 is equipped, as standard, with the Bosch 9.1MP ABS system with integrated pressure sensor. A key element of the Ducati Safety Pack (DSP), it combines state-of-the-art safety with superlative stopping power. Thanks to integration with the Riding Modes, the system provides shorter stopping distances with enhanced stability in any riding condition. While system level 1 enables sport-oriented ABS intervention with no rear lift-up prevention, level 2 delivers the same intervention with moderate rear lift-up prevention. Lastly, the highest level 3 setting provides exceptional braking stability and maximum rear wheel lift-up prevention. An integral part of the Ducati Safety Pack, the DTC system acts as an intelligent “filter” between the rider’s right hand and the rear tyre. It lets the rider select one of eight different intervention levels. Each of the three Riding Modes has default DTC levels but these can be personalised to suit individual riders’ styles and road conditions. Ducati Riding Modes were a motorcycle engineering milestone, letting riders select – depending on the model – different settings that tailor motorcycle behaviour to individual riding styles and differing road conditions: Sport, Touring and Urban. Each Riding Mode is programmed to vary the engine ‘character’ (Power Modes) and the ABS and DTC intervention levels instantaneously, even on the go. The available modes stem from a combination of cutting-edge technologies. Electronic Ride-by-Wire (RbW) uses the innovative Ducati e-Grip system to manage different mappings and adjust power delivery (Power Modes), while Ducati Traction Control (DTC) features eight levels of system interaction to enhance control by reducing rear wheel spin. Lastly, the ABS system, designed to prevent wheel lock during braking, offers three different intervention levels. Sport Riding Mode delivers 109 hp of power with direct RbW throttle twist response, reduced DTC intervention, level 1 ABS braking efficiency and rear wheel lift detection disabled. Touring Riding Mode delivers 109 hp of engine power with a more progressive RbW throttle twist response, increased DTC intervention, level 2 ABS braking efficiency and moderate rear wheel lift control. Urban Riding Mode delivers a maximum power of 75 hp with progressive RbW throttle twist response; DTC is set to an even higher intervention level and the ABS is set to level 3, maximising braking stability and wheel lift-up prevention. Monster 821 accessories include Ducati Quick Shift (DQS) up/down, a race-derived electronic system that lets riders up-change without using the clutch and without having to close the throttle and down-change without operating the clutch, just closing the throttle. It consists of a two-way microswitch built into the linkage of the gear change lever; when actuated, it sends a signal to the ECU. The system works differently for upshifts and downshifts, integrating adjustment of spark advance and injection during upshifts with an auto-blipper function during downshifts. Extent and duration of system operation are defined to ensure seamless gear meshing under all ride conditions. When accelerating the DQS saves precious fractions of a second that would otherwise be lost in closing the throttle and acting on the clutch: moreover, stability is improved as power delivery is absent for less time. When downshifting during braking, the DQS system allows smooth, clutchless gear engagement, letting riders focus on braking and corner entry. This system not only boosts the enjoyment of sports riding: it also lends a welcome hand in city traffic or on winding roads requiring frequent gear changes. The Monster 821 instrument panel has a colour TFT display that shows selected gear and fuel level. Now repositioned to allow easier daytime reading, the display has three different configurations, each designed to show information that is best suited to certain riding situations. All three screen configurations show the currently selected gear. In Urban Riding Mode, the display adopts the Core configuration, minimising the shown data: ideal for downtown riding. The clearest information is vehicle speed, displayed in the centre of the screen, while the selected gear is shown on the right. In Touring Riding Mode, the display changes completely and goes to the Full configuration to display as much useful travelling info as possible. In Sport Riding Mode, the display adopts the Track configuration, providing only information related to sport riding. The rev counter graphic is reset with a Superbike-style layout. The TFT control panel on the Monster 821 can be personalised and the rider can choose the display mode regardless of the selected Riding Mode. Moreover, the Monster 821 instrument panel is ready to display info related to the Ducati Multimedia System (DMS); the latter lets riders connect their smartphones via the Bluetooth module (available as an accessory) and control some of its functions via the switchgears. The panel displays music player controls and earphone connection, incoming call and received message status icons. Moreover, the Monster 821 has an under-seat USB port to recharge smartphones and other devices. On the Monster 821 the headlight provides a powerful halogen light source and features LED “horseshoe” side lights, a feature on all Ducati naked bikes. LED lighting is also incorporated at the rear. Moreover, the Monster 821 has a Hazard lights function, activated by pressing the left indicator switch for four seconds. STANDARD EQUIPMENT Riding Modes, Power Modes, Ducati Safety Pack (Bosch ABS + Ducati Traction Control DTC), Ride-by-Wire, TFT colour display, Passenger seat cover. Up&down Quickshift (DQS), Anti-theft system, Ducati Data Analyzer (DDA) ready. * Only for countries where Euro 4 standard applies. Standard Equipmen Riding Modes, Power Modes, Ducati Safety Pack (Bosch ABS + Ducati Traction Control DTC), Ride-by-Wire, TFT colour display, Passenger seat cover. Up&down Quickshift (DQS), Anti-theft system, Ducati Data Analyzer (DDA) ready. Riding Modes, Power Modes, Ducati Safety Pack (Bosch ABS + Ducati Traction Control DTC), Ride-by-Wire, TFT colour display, Passenger seat cover. Up&down Quickshift (DQS), Anti-theft system, Ducati Data Analyzer (DDA) ready. New 2019 Motorcycle Model Extravaganza! November 8, 2018 Michael Le Pard 2019 Motorcycle Models, News, What’s New Comments Off on New 2019 Motorcycle Model Extravaganza!